If you go to Rwanda and you’re interested in ICT and tech, chances are, you will soon pass through kLab, Kigali’s tech innovation hub. And so it was for me two months ago, when I started data collection for my research on innovation networks in Sub-Saharan Africa. I had a clear strategy: Through interviews, I wanted to elicit the support networks of early stage entrepreneurs that are in the process of marketing and scaling mobile application, software, and content innovations. I had a hunch that I would get a biased view if I only approached those entrepreneurs that are at kLab and therefore easy to find. So I made every effort to go beyond the hub. However, I quickly found that virtually every early stage tech entrepreneur in Kigali had some sort of relationship with kLab. At the same time, these interactions were extremely varied, differing in nature, intensity, and duration. 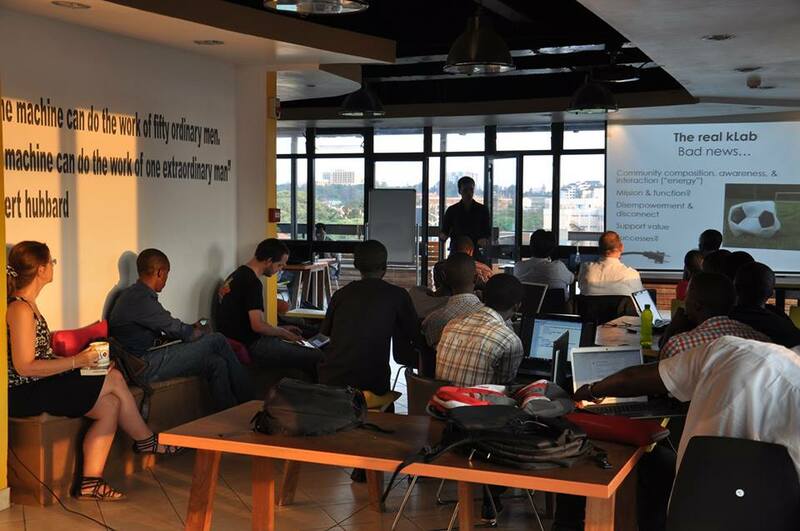 I came to the conclusion that, if I wanted to understand Kigali’s tech innovation network, I would need to hone in on kLab and tease apart its many roles and functions. This blog post will thus capture my preliminary findings specifically on kLab, while I will cover other organizations supporting entrepreneurship in Kigali as well as contextual factors in a future post. This post also summarizes the outcomes of a presentation and group discussion that I facilitated at kLab towards the end of my month-long stay. For those running and analyzing hubs, it has almost become a trope that “a hub is its community.” While this grassroots ideal is universal to almost all hubs, kLab is a great example of how difficult it can be to define what is the right community for a hub to be effective, and who should be included and excluded. Many of the kLab members that I interviewed expressed a sense of like-mindedness and mutual respect towards other members, and most listed several friends and collaborators that they would meet and work with while in the space. Yet, kLab has also faced many tough tradeoffs that were due to limited desk space and bandwidth, and to the fact that the hub has only one full-time staff: the general manager. 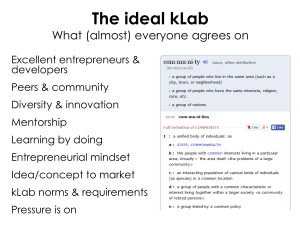 In particular, kLab has grappled with balancing selectivity and openness. On the one hand, the idea of a tech innovation hub is to bring in a flurry of new and different people to enable a buzzing environment and creative exchanges. On the other hand, startup teams working on digital products need stability, focus, and continuous mentorship, which are usually not afforded in an open, crowded co-working space. Over the 2 years of its existence, kLab has basically tested both ends of the spectrum. 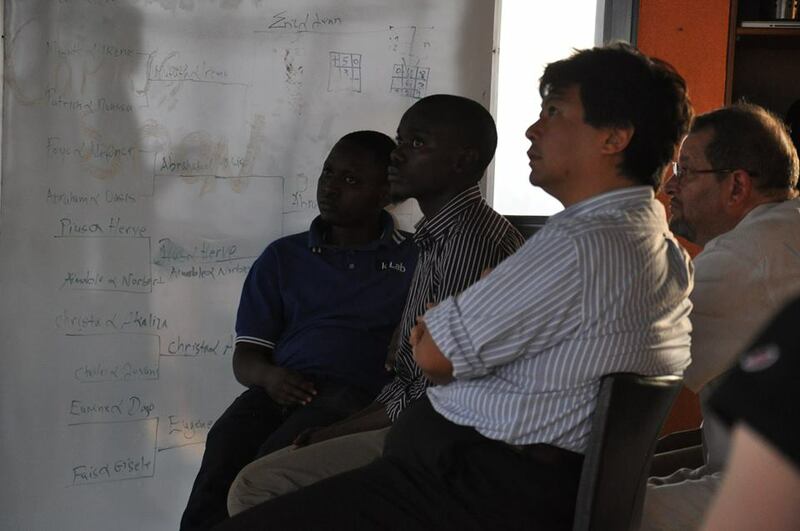 During its first phase of implementation, only a select few teams were let to use the hub, while more recently, the space has mostly been operating at full capacity and frequented by a large but changing crowd of newcomers and students. The first model was considered as not inclusive and effective enough to serve Kigali’s numerous aspiring techies. However, also the more open model has faced issues, namely an “internet café” syndrome of sorts, where (as several interviewees reported) it became impossible to know everyone using the space personally, and where it wasn’t clear anymore who was there to work on a digital product and who was just browsing Facebook or torrenting. In other words, while the fast-increasing “headcount” at first seemed to be a great success for kLab, ultimately doubts arose as to whether this would actually strengthen the community composition and translate into a greater number of successful digital innovations. kLab now aims to implement a tier system, where more senior and focused members have privileged access to resources, while newcomers’ time is restricted, unless they apply to enter the higher ranks. Like many other hubs, kLab is governed by a board representing multiple stakeholder groups, most of which were driving forces in the hub’s founding process. Namely, kLab’s board includes the ICT Chamber (an association of Rwanda’s ICT companies), the Nyaruka startup entrepreneurs, the Rwandan Development Board (which provides for kLab’s space), CEOs of established ICT companies, and Carnegie Mellon University Rwanda. The idea behind such a setup is that a central position in the local multi-stakeholder innovation network enables the hub to mobilize resources, backing, and contacts for entrepreneurs. Yet, as in other cases and as can be expected, board members that hold senior positions and have full-time responsibilities apart from the hub are not usually able to spend extensive amounts of time in the space and stay on top of its daily affairs. For kLab, this brought up the difficult question whether the current governance structure risks to result in a disconnect between the board and the entrepreneurs that it is meant to serve. While several entrepreneurs benefitted from ties that board members arranged for them, others said that the board was not geared towards awareness of their challenges or working directly in their interest. This issue reflects the broader conundrum of how an entrepreneurial grassroots organization can govern itself while also integrating important partners with institutional backgrounds and business experience. For some interviewees, elements in the Rwandan culture exacerbated the effect, because the entrepreneurs’ humility and shyness meant that they would not stand up for their cause and take a more activist role in shaping kLab. Ultimately, several members acknowledged their responsibility and advocated regular plenary community feedback sessions and greater representation on the board. What Is kLab for Non-Members? Innovation hubs are also meant to be places where visitors with various backgrounds and interests can convene and contribute to tech startups’ efforts. Hubs usually have a greater visibility and brand value than the fledgling member entrepreneurs—and kLab, which is fairly well-known at least among tech innovation stakeholders across Africa, is no exception. And indeed kLab functions as a convenient focal point for foreign development organizations, ICT businesses, tech-focused NGOs and entrepreneurship supporters, government representatives, researchers, and more. The same applies locally: interviewees from more established ICT companies mentioned to me that kLab is often the first address when looking for coder talent or (though rarely) investment opportunities. Government agencies like the Ministry of Agriculture have interfaced with entrepreneurial software developers through kLab, running hackathons and innovation prizes. kLab occupies the top floor of the Telecom House that is meant to be a one-stop shop for IT in Kigali and also hosts the ICT Chamber, CMU Rwanda, and an ICT-oriented unit of the Rwandan Development Board. However, here as well, tradeoffs and questions for kLab have become apparent over time. I often heard that the place can be intimidating for non-techies who don’t always find it natural to overcome the social and communication barriers resulting from kLab’s coder-centric culture. Moreover, some interviewees mentioned that national and international media have a tendency to overly promote kLab’s successes (and kLab has an incentive to feed these stories), to the point where the increased attention can have risks. Such stories easily embed kLab in the narrative of Rwanda’s rise as an African ICT Hub, but some entrepreneurs feared that this outsize public image distracts kLab from its grassroots mandate, making it too comfortable and unable to address challenges outright. More broadly, participants also detected a romanticization of entrepreneurship. Often, the urge to highlight and celebrate success stories and role models appeared to have diluted the conversation on the challenges that Rwandan tech entrepreneurs still face. 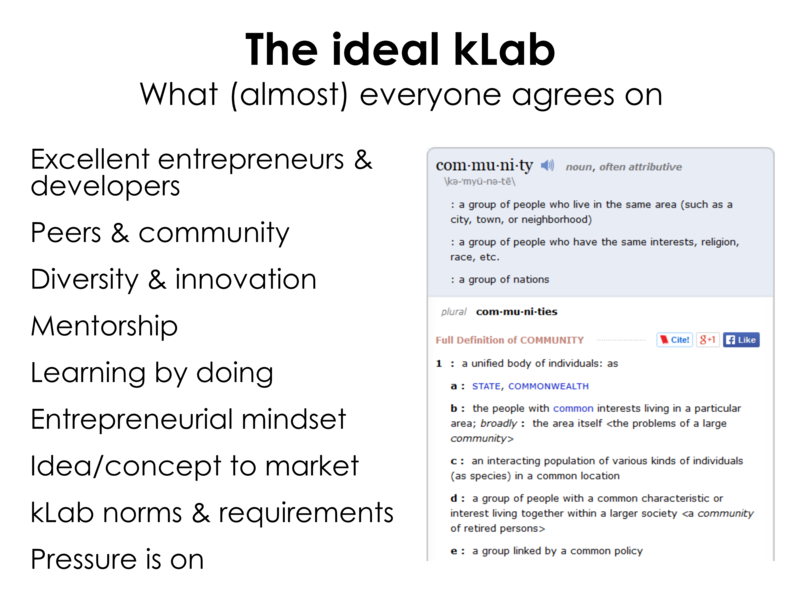 I found kLab to be an intriguing tech hub example that reflects many issues relevant for hubs across Africa. To me, kLab represents a microcosm of the complexity of multi-stakeholder innovation networks, and an insightful use case that illustrates how difficult it can be to enable a local digital economy. Weaving the interests, perspectives, and contributions of all relevant groups—from university graduates to established tech companies to government agencies—into one coherent organizational form isn’t easy, and kLab’s growing eagerness to learn and engage in honest dialogues can only help it on this path.